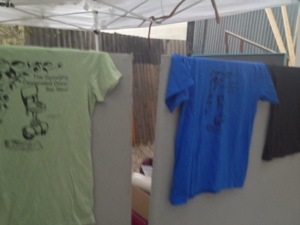 Just hand silk-screened a short run of “color options” posters for the GyroGPS Designated Driver Bar Stool. You can choose to have J. Haley add any color or pattern of which you dream, for a nominal fee. Also, try taking a print home to color yourself for a fraction of the cost!… Heck! 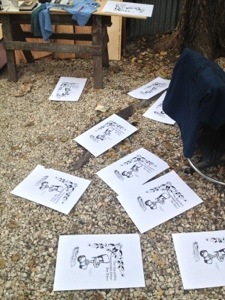 You can even color it here, at the Pop-up Parking Lot Product Lab at Pump Project this coming Saturday or Sunday. While supplies last. 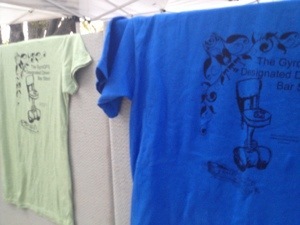 Also a few GyroGPS Tees made it out of the screening flurry… a men’s large on blue, and a women’s green, and the elusive ladies style black on black tee. These are very limited runs and won’t last long. All works will be signed in your presence with a special note just for you, in order to verify authenticity.